Unless this is the first hockey-related thing you’ve participated in for over six years, you know the Chicago Blackhawks and Los Angeles Kings have an absolute stranglehold on the Western Conference. They have combined to win the Stanley Cup five of the past six seasons and control the fates of everyone in the West. Or so it seems. Something feels different this time. The Kings have been the usual Kings, driving possession and winning games and have actually been at the top of the Pacific Division for most of the season. Still, there is an uneasy feeling around Los Angeles as two other Pacific Division foes look just as strong and ready to challenge the Kings this season. The Blackhawks are a different story. Outside of their 12-game win streak in the middle of the season, Chicago hasn’t been their dominant selves. Even within that win streak there were plenty of games they perhaps should have lost if not for the heroics of goaltender Corey Crawford. More so than the Kings, the Blackhawks seem incredibly vulnerable going into the postseason given their play so far. Chicago is giving up scoring chances and high-danger scoring chances at a high-rate this season. Of their past five seasons, only last season did they give up scoring chances at a higher rate than this one. The problem this year, is they haven’t been offsetting those with scoring chances of their own. They are producing scoring chances at the lowest rate of all their past five regular seasons. They haven’t had the puck nearly as much as in the past five seasons. They also have a couple of challengers in their own division. The combination of the Blackhawks’ and Kings’ vulnerabilities and the rise of several other teams may make for a fresh group of winners in the postseason. The feeling around these playoff-chokers of the past is off this season. They aren’t getting a ton of attention despite holding a playoff spot in the Pacific for most of the year. As of Saturday morning, they sit just three points back of Anaheim for second in the division and seven back of L.A. for first. They have just one game left against the Kings to make up that ground, so they likely aren’t catching them for the division title. Still, they deserve a lot of credit for the season they are having, especially on the road. Nobody in the NHL has more road wins than the Sharks, so maybe they want to stick in that third spot in the division. Typically in the Stanley Cup Playoffs, power play opportunities decrease as the referees let the players play a little more than they normally do. If the game goes to sudden-death overtime, you won’t be seeing a power play unless the infraction is blatant. This all bodes well for San Jose as they have been one of the better 5-on-5 teams in hockey this season. The Sharks have been one of the best at limiting and creating quality chances playing 5-on-5 this year. According to war-on-ice.com, they have the highest differential of high-danger-chances for/against in the NHL and by a significant margin. 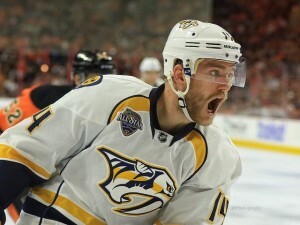 They have posted a HighDangerScoringChancesFor% of 56.6 this season, next best is the Nashville Predators at 55.2. They don’t allow many opportunities and they create more than 28 other teams in the NHL. Only the Dallas Stars create more quality chances at even strength than the Sharks. The play of Joe Thornton has been superb this season. He hasn’t lost a step in terms of production, that’s for sure. Only six players in the NHL have scored more points at even strength this season and only one player has more even-strength assists. To fans, that doesn’t matter when it comes to Thornton. Can he maintain his rate of production in the playoffs and lead the Sharks deep into the postseason? If he can, the Sharks will be a big challenger in the Pacific Division bracket. Well well well, look who found themselves some offensive threats. Nobody in Nashville is winning an Art Ross Trophy any time soon but they have quietly added layers of attack on the offensive side of the puck. Like the Sharks, the Predators are a rock-solid team at even strength. They are just five points back of the Blackhawks for third-place in the Central and possess a team that can go deep into the playoffs. If you want lots of chances to score, don’t play the Nashville Predators. They give up the fewest quality chances playing 5-on-5 in the NHL and the second-fewest overall scoring chances. That strong play in their own end by the entire group on the ice allows them to possess the puck more than most in the league. At 52.6%, they have the fourth-highest CorsiFor% at even strength in the NHL, behind only the Kings, Stars and Ducks. This team controls the puck playing 5-on-5 and if teams don’t capitalize on their few chances they get, the Predators usually win the contest. A big reason that they now can truly be considered an option to go deep is the trust in Pekka Rinne. He simply hasn’t been himself this season but has looked better in the past couple of months. The save-percentage has risen and Nashville has somehow tightened up more defensively for him. Speaking of that defense, nobody boasts a better blue-line in the league. Even without Seth Jones, this defense is a daunting task to take on for opposing forwards. Barrett Jackman, Ryan Ellis and Mattias Ekholm are shot-suppressing machines and then they’ve got guys like Roman Josi and Shea Weber to load up the offense. They have high-talent forwards now as well, especially with the addition of Ryan Johansen. He has 22 points in 32 games since coming over from Columbus. Mike Ribeiro and James Neal have both contributed nicely playing 5-on-5. Filip Forsberg had a slow start but has now taken over the scoring lead for the team. They’ve got guys who are constant threats to score now, more so than they ever have. They will be a team to watch in the postseason, especially if Rinne returns to his Vezina-form. They are a threat because deep down, they always have been. The goals have finally started to pile up for them. Bob Murray deserves some credit for this mid-season turnaround they’ve experienced. 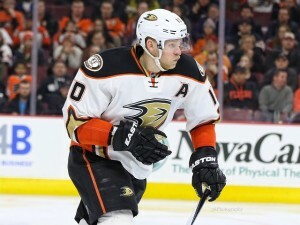 Going out and snagging David Perron was a huge move, as Perron has put up 20 points in just 27 games with the Ducks so far. Ryan Garbutt has quietly been a solid depth acquisition. Jamie McGinn has four goals in nine games since being acquired at the deadline. Murray refused to sit and watch his team struggle through the season. He also resisted pressure to fire Boudreau which looks like the right move. The job he has done with this team is remarkable. As for the numbers, Anaheim never seemed to be in much trouble. While they weren’t scoring, they were shooting at an absurdly low shooting-% that was bound to trend up at some point. It has in a big way, as the Ducks have scored the most goals out of anyone in the NHL since January 1st. They have also allowed the fewest goals since January 1st. That combination is usually a pretty good sign for a team. Only Dallas and Los Angeles have a higher CorsiFor% than Anaheim this season. They allow very few quality chances. They are, without a doubt, a serious Cup contender and a threat to the best of the West. We have arrived at the wild card of the group. Not that they will finish in a Wild Card position, they are actually sitting at the top of the Central as of Saturday morning. This team is a “wild card” team because of their style. Nobody knows what is going to happen. They could sweep anyone or be swept by anyone. They’re volatile, and they’re ready to show it in the Stanley Cup playoffs this year. Offense, offense and more offense. The different layers of attack they have when fully healthy is extraordinary to see. One shift your dealing with Jamie Benn, Tyler Seguin and John Klingberg on the ice at once. You survive it, but you look over and see Jason Spezza and Patrick Sharp fly over the boards and immediately into the offensive zone. After that, the depth can score too. Antoine Roussel has 12 goals this season. Cody Eakin has 14. Underrated rookie Mattias Janmark has 13. Ales Hemsky is always a threat on the ice. Then you’ve got a guy like Val Nichushkin who is always getting top-shelf chances. There are so many players that can burn opponents on this team that it is going to be tough to match-up against them. Nobody in the NHL creates more high-danger chances than the Dallas Stars. In 72 games, they have only been kept to two goals or less 20 times, and a good portion of those were still victories or overtime losses for the Stars. They are consistently dangerous on the ice and there isn’t much hope in shutting them down. The best way to attack the Dallas Stars is to take it to them offensively because their defense and goaltending is still, for the most part, below average. If a team tries to defend their way to wins over Dallas, they won’t have much luck. The Stars pose a threat to the former champions of the West this season, especially the Blackhawks. The Kings play-style is a solid counter to what the Stars bring but the Blackhawks play-style lends itself to some blowouts when facing the high-octane Stars. The Predators would be an interesting strength versus strength match-up. A high-flying offense taking on the best defensive team in the game would be a fun thing to watch transpire. As for the Ducks, I’m sure there is still some hatred left over from two years ago. Those two played a hate-filled, exciting six game series two playoffs ago and that would make for an entertaining bout. The Stars will certainly be a huge challenge to the Central division bracket and beyond this spring.